Peter Martin: It's a two-speed economy aright. Hello Sydney.. It's a two-speed economy aright. 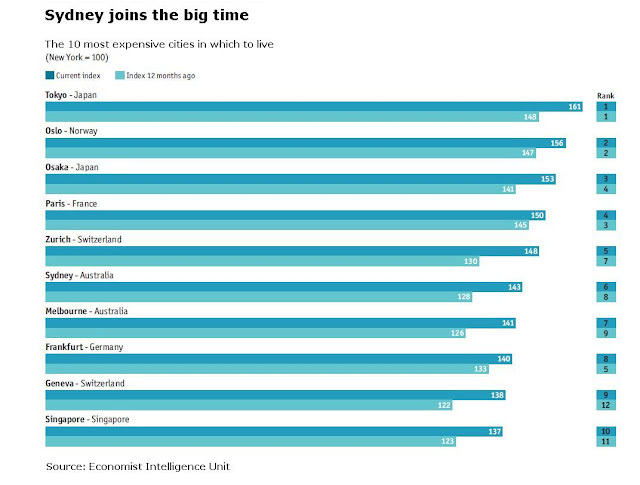 Hello Sydney..
Sydney has joined the upper ranks of the world’s most expensive cities as its economy turns sour. New figures show NSW shedding jobs at the fastest rate in the nation, losing 22,100 workers during six months in which every other state bar Tasmania built up employment. The Bureau of Statistics figures show Victoria gained 25,300 jobs in the six months to June, Western Australia 17,100; South Australia 11,100 and Queensland 4900. The losses in NSW turned what would have been a respectable national jobs performance into a mediocre one and helped redefine economic geography. Victoria is emerging as a winner from what Treasurer Wayne Swan calls the “patchwork economy” along with the mining states of Western Australia, Queensland and - these days - South Australia. The losing states - whose economies are lagging on a measures including wages, consumer spending, jobs and population - are NSW, the ACT and Tasmania. The decline is new... During the second half of 2010 NSW outperformed the rest of the nation by a wide margin. Sydney’s outsized finance sector might have something to do with it too. “Finance firms were hording labour last year in anticipation of good times. Now they are slimming down by not replacing staff,” said Mr Smirk. 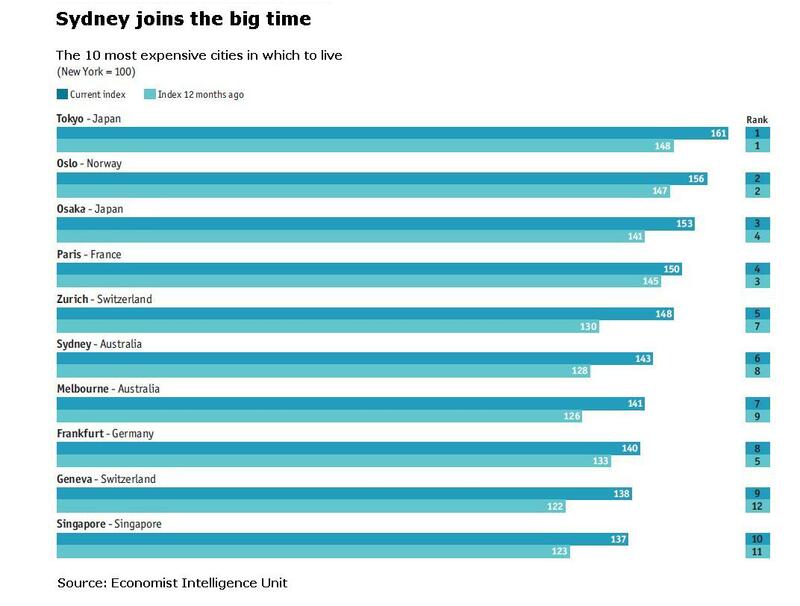 The worldwide cost of living survey released yesterday by the Economist Intelligence Unit moves Sydney up two notches to become the sixth most expensive city in which to live. Sydney’s prices eclipse those in London, Vienna, Rome, and New York. Only Toyko, Oslo, Osaka, Paris and Zurich remain more expensive. The survey includes rents, electricity, public transport, private schools and the price of domestic help. The intelligence unit priced a one-day business trip to Sydney at $US627. The cost included one night's accommodation, a two-course meal, a simple meal, two taxi journeys, a drink in a hotel bar and an international newspaper. The managing director of the Sydney-based funds management firm Rismark International Christopher Joye said much of the apparent increase would have measured the 20 to 30 per cent surge in the Australian dollar. Australia’s national unemployment rate remained steady at 4.9 per cent in June as jobs growth did little more than keep pace with population growth. The NSW unemployment rate climbed to 5.2 per cent. Victoria's slipped to 4.6 per cent and Western Australia’s to 4.2 per cent. in the developed world. “When the global financial crisis hit, our unemployment rate was the same as the United States. Now it is half that,” he told parliament.
. We're being swamped. Less. Murdoch controls minds. Yea, sure. The things people FoI. Treasury electricity use. "Economists are not like dentists"
Now its a global trade war. Soon. Modelling. What'll the carbon tax do to prices? Carbon tax. You want GST on top of that? You think our Labor leader is bad? Gee, how are our mining companies doing?